Years ago, Italians often took three hour lunch breaks and ate mutli-course meals. As times have changed, it is more rare for Italian families to gather at the table during lunch and have a full home-made meal. Italy’s economical situation is such that many mothers have had to take on full-time jobs, children are in school until mid-afternoon and most people do not have time to go home during lunch time. Typically, people working in offices have a 1-hour break and eat lunch at a bar or pasticceria, that offers foods to go, such as fresh made sandwiches, prepared salads, or square slices of pizza or stuffed focaccia. Italian sandwiches aren’t multi-layered, American style sandwiches but, usually, just simple focaccia bread with a few lean slices of prosciutto, some sliced tomatoes with mozzarella or pecorino cheese. Italian pizzas are very thin. have limited toppings and are usually vegetarian. Bread without butter and salads are also very common at lunch. Pastas are also popular and usually full of vegetables. One exception is on Sundays, many families will have a large, 2-3 hour lunch and often eat this meal out in a restaurant. As a child growing up in an Italian-American home, I remember Sundays were pretty much reserved for family. My father would take us to visit our grandparents or other relatives while my mother prepared the Sunday meal. Sunday lunch was really dinner but held early in the afternoon. After my grandmother died, when I was quite young, my grandfather would often join us for Sunday dinner. As my children were growing up. I tried to make meals an important time to be together and we kept some of the traditions built around meals. Lunch, however, was lunch – a quick meal. Through the years I have gravitated toward lighter and healthy selections for lunch. My favorite food for lunch is soup, so I keep a number of containers in the freezer to pull out when I feel like soup for lunch. Salads or typical items found on an antipasto tray are also a favorite. Below are two soup recipes that are substantial enough for lunch and two salad recipes that I hope you will enjoy. Escarole is a leafy green vegetable and member of the chicory family, along with frisée, endive and Belgian endive. You can find it in the lettuce department of your supermarket. In soup pot, heat oil and saute shallots for two minutes. Add both containers of chicken broth and bring to a boil. Add tortellini, return to boiling, reduce heat to low, cover the pan, and simmer about 5 minutes. Add the escarole and simmer until the greens are wilted. Add parsley and salt and pepper to taste. Serve soup with shaved Parmesan cheese strips. 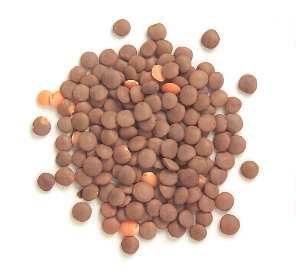 Lentils are a small but nutritional member of the legume family and are a very good source of cholesterol-lowering fiber. Cover the lentils with water in a large bowl. Let soak for 1 hour. Drain and rinse. Heat oil in a large soup pot and add garlic, onion, celery, carrots and potato. Cook, stirring several times, for 10 minutes. Add water, chicken broth, lentils and barley. Bring to a boil, reduce heat, cover pot and simmer 45 minutes to 1 hour. Check the lentils and barley, to see if they are tender, after 45 minutes. Add tomatoes, oregano salt and pepper. Bring to a boil, reduce heat and simmer 10 minutes. My favorite salad is made of fresh tomatoes and fresh mozzarella cheese. Tear fresh basil leaves and sprinkle liberally over the slices. Add salt and freshly ground pepper to taste. Just before serving, drizzle with top-quality extra-virgin olive oil. Chickpeas are a legume used in many Mediterranean, Middle Eastern and Indian cuisines. Round and tan colored, chickpeas have a mild, nutty flavor. They are also known as garbanzo beans. Whisk olive oil and lemon in a salad bowl. Add remaining ingredients and toss well. Chill. Serve over tender lettuce leaves (such as, Bibb).